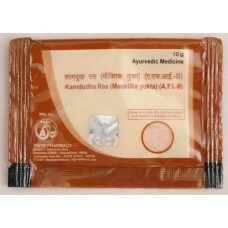 Kamdudha Ras relieves chronic acidity, heartburn, stomach ulcers and colic pains. It soothes hyperacidity, provides cooling relief in ulcers, stimulates production of digestive enzymes and boosts your digestive system. Kamdudha Ras is prepared through an elaborate, painstaking method by purifying and combining the goodness of natural ingredients. It is very effective in long-lingering ailments. Experience the soothing effect of Kamdudha Ras on your stomach and enjoy lasting relief from acidity and ulcers.